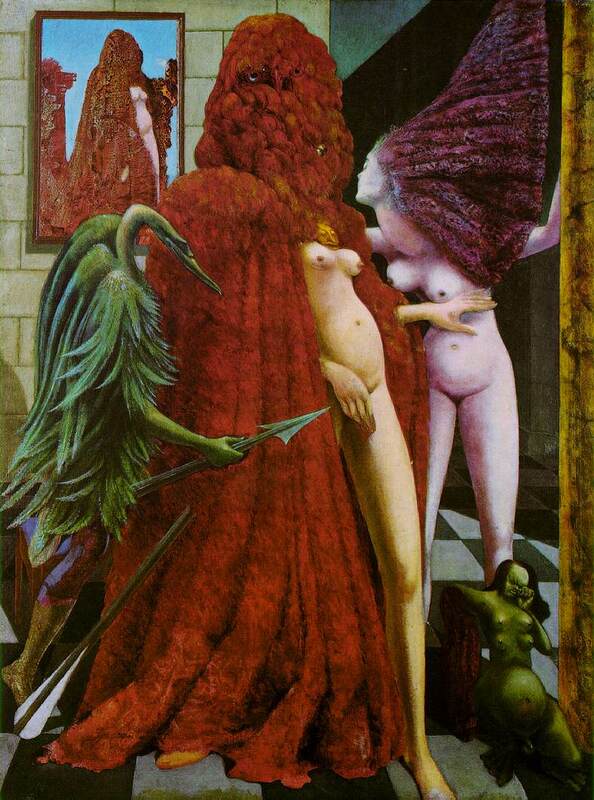 Max Ernst, The Attirement of the Bride (L'habillement de l'épousée), 1939-40. Oil on canvas. 129.6 x 96.3 cm. Ernst tended to make his paintings in groups, which were connected by subject, technique, or both; The Attirement of the Bride is no exception. It falls into a series of works in which Ernst was experimenting with two things: the human form and a relatively new technique called decalcomania, which he helped to perfect and popularize. The process of decalcomania was executed by placing a piece of glass or paper onto the painted surface and then pulling it away. In The Attirement of the Bride, however, Ernst used decalcomania in conjunction with a precise method of painting. The result is confusion for the viewer of whether or not the images on the canvas are the result of the chance of decalcomania or the preconceived notions of Ernst. The above painting is unique in the way that Ernst used decalcomania because in most of his other paintings of the time the technique was intended for the purpose of metamorphosis, turning random shapes into things like plants and animals. In such cases, the development of images was independent of Ernst, but The Attirement of the Bride incorporates a fantastic realism that allows the figures to develop more by his personal design. Ernst used the process to emphasize and detail the picture in the upper left corner, the headdress of the woman on the right, and the robe of the central figure. William S. Rubin, Dada and Surrealist Art (New York: Harry N. Abrams, Inc., 1970), p.178. Werner Spies, Max Ernst: A Retrospective (Munich: Prestel-Verlag, 1991), p.230. Martica Sawin, Surrealism in Exile and the Beginning of the New York School (London: The MIT Press, 1995), p.204. Uwe M. Schneede, Surrealism (New York: Harry N. Abrams, Inc., 1973), p.72. Were you saving this post just for me?